I ventured to Ipswich today to get my tomatoes and stopped a few hours to see what was going on. After arriving on ex P&R B7rle 69431 I was alerted by Harry Stanley that a Replacement Bus was operating a Felixstowe service. So I hopped on an incredibly quiet 30888 - Yarmouth won't recognise her - to Ipswich Station. On the way I passed 32653 which was surprisingly on the 66 - the first ex Lowestoft ALX400 I have seen on the route so I presume guide wheels have been fitted. Taken from 30888 ex Lowestoft ALX4oo 32653 is seen on the 66 for the first time by me anyway! 30888 creeps silently towards Ipswich Rail Station in bright sunshine. Thanks to the driver who was creeping along to allow me time to get that pic. However I got to the station just in time to see First Hampshire coach 23312 disappear into the sun, so went back into town and popped into Ipswich depot to see what I could see. Not a lot to see and the chap I was hoping to see was at a meeting but I couldn't make this post without saying just how friendly the team at Ipswich Depot are. Ok I was wearing my custom printed SB&TP t-shirt (with Anglian gas bus on front!!!) but without excpetion I got a grin and friendly greeting from everyone. Ipswich engineering team truly are the jewel in Eastern Counties crown and an example many other depots could follow with their friendly and welcoming attitude to visitors. However I didn't leave empty handed on the information front, and I was informed that refurbished E200 44519 had just gone back on the road. After quite a chase and camera malfunctions I finally caught up with her during a driver change outside OCM so SB&TP is proud to be the first blog to bring you its own pics of said 44519. 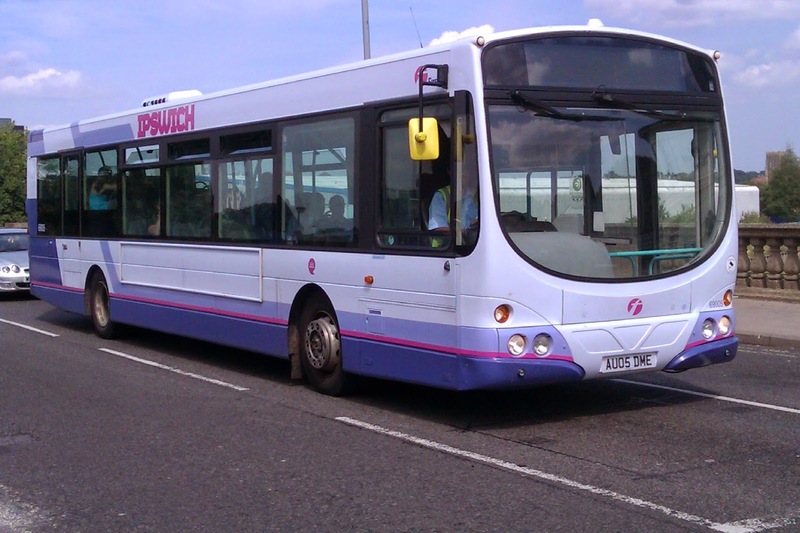 First Ipswich 44519 E200 YX09 ADO back in service outisde PALS today. Pic by myself. I can also let you know that those camping outside Ipswich depot tonight waiting for 32479 to return will be disappointed as she is not coming home till tomorrow evening (Friday). After a day having safety inspections on Saturday my guess is look out for the Felixstowes on Sunday. The missing E200 44516 is due this weekend. I also managed to get a shot of 23312 on its return from Felixstowe, quite an eyecatching vehicle and the driver, who I was chatting to at Ipswich Station loves it - he was really purring about it. Finally here's a not bad pic of the bus that started all the frenzy for info in Ipswich, and will be the last to be repainted. Volvo B7rle 69005 was on the 53's today and I'm still undecided if I prefer that livery or the new one. After a few days having some TLC at Caister Road the best looking bus in the East of England Enviro 400 33423 is back on the road on the X1 between Norwich and Lowestoft. 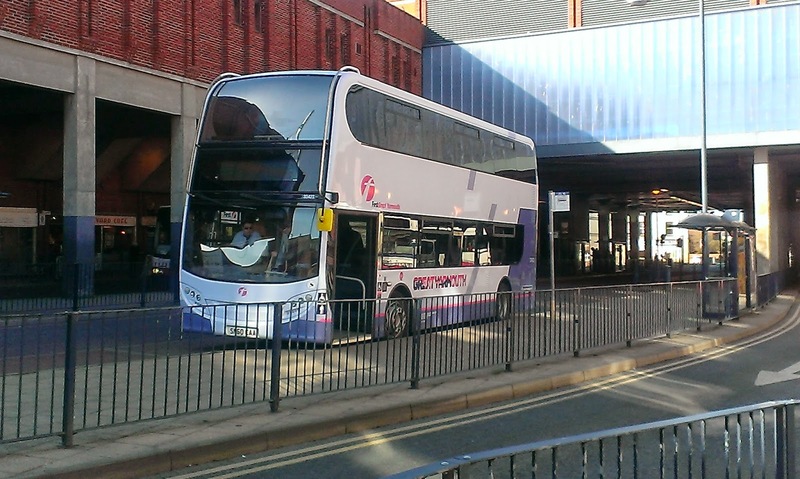 Jamier Skinner was suffering on Volvo B10 Renown 60808 when he took this pic which I think is somewhere in Gorleston. Cheers, Jamie and better luck next time with your vehicle! When I was a boy doing my enthusing on Invictaway to and from London the only blot on the landscape was Victoria Coach Station. Dirty, hot or cold depending on the season, crowded, poor information and running the gauntlet of moving vehicles to get to your coach. In the late 80's when a coach driver myself the worst and most frustrating place I ever picked up was Victoria Coach Station. Fast forward 25 years and over recent weeks thanks to Megabus my horizons have expanded and the country has been reopened for me. This has meant travelling via London and Victoria Coach Station. It has also felt like travelling back in time as nothing, I repeat nothing has changed. The heat in the un-airconditioned departures building was so intense people were standing on the concourse, getting in the way of vehicles. The "information" boards, although modern looking still had naff all information on them. It costs 30p to have a pee and the loos are hardly anything luxurious. The small refreshment outlets are more expensive than those at Victoria Railway Station (believe me that's saying something), and the majority of staff treat passengers with contempt and requests for information are deemed an inconvenience. I was told that TfL make as fortune out of Victoria Coach Station and I can see why as they have clearly spent very little on it in half a century. The trouble is they know there is no viable alternative at present and that is a problem. VCS is in a central location and to move to a purpose built hub further out wouldn't make it as convenient. However maybe a transfer hub so people connecting to other services don't have to go through London might be an option and would reduce the number of people passing through VCS. It is time some heads got together and did some serious thinking. VCS is decades behind the times and spoils what otherwise is a pretty good travelling experience. We see tube stations transformed, new rolling stock, a multi-billion pound Crossrail project and so on, yet those who choose to travel by coach are still treated like 18th Century peasants, and have the facilities to match. It is a disgrace, and TfL, along with those companies who are happy to tolerate those conditions should be ashamed. It is a sad day. 48 hours ago you could see a bus at Lowestoft showing a destination 121 miles away. Today the furthest destination you can see is that on the X2 to Norwich. It appears the Eastern section of the X1 has been domesticated and as such leaving Lowestoft it can't even show Norwich on the destination but Great Yarmouth with connection for Norwich. So actually the X1 has been split into 3. Now this is not a criticism of First - although I'm not a fan of the split in anycase - but the ridiculous regulations and red tape coming over from Brussels that is blighting our transport system. And one of the biggest changes has been the death of the long distance bus route. Oh they can exist but each section has to be separately defined and shown. That may please the bureaucrats in their air conditioned offices but it is extremely confusing for passengers. Let me give you a couple of examples. 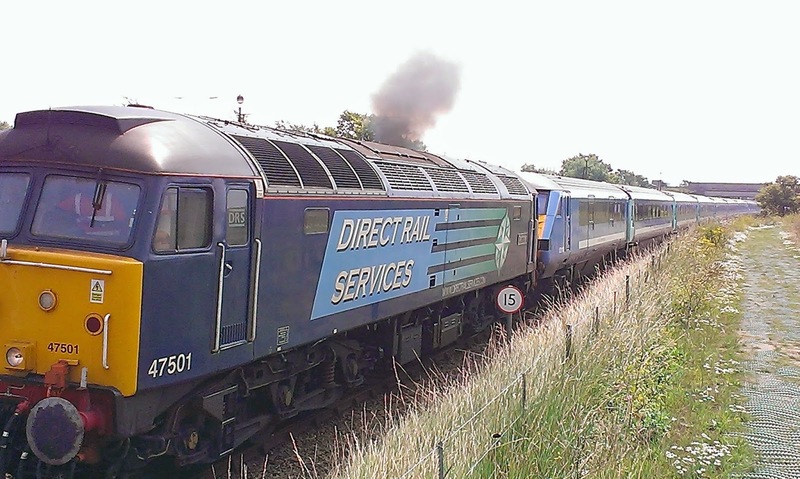 When I was a boy one of my favourite routes was East Kent's 550 from Dover to Hastings. A lovely route on the top deck of a Bristol right along the coast. There was at least one driver change en route, sometimes two. When Stagecoach took over East Kent they went even further and extended the route to Eastbourne and Brighton. Took ages but one bus, one route, one destination. They also had routes from Ramsgate to Medway. Another route ran from Sevenoaks to Folkestone. One bus, one destination. To do that journey today you have to do it in 4 stages using 3 different companies. 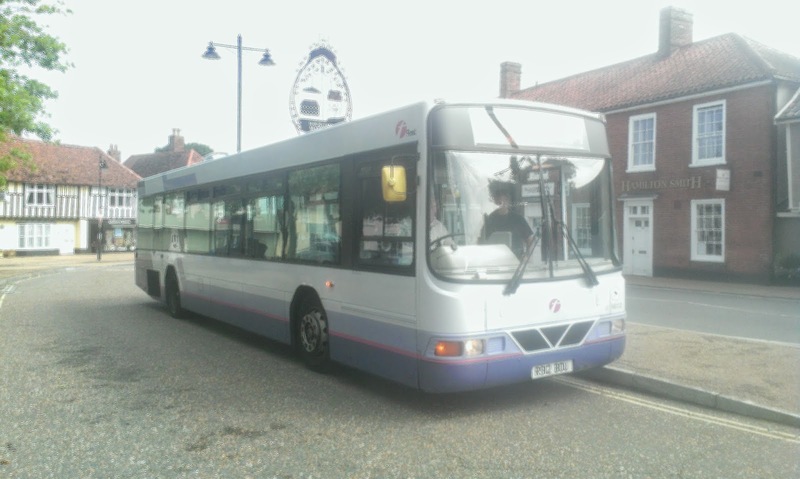 Today I caught for the first time in ages the 62 from Halesworth to Lowestoft. 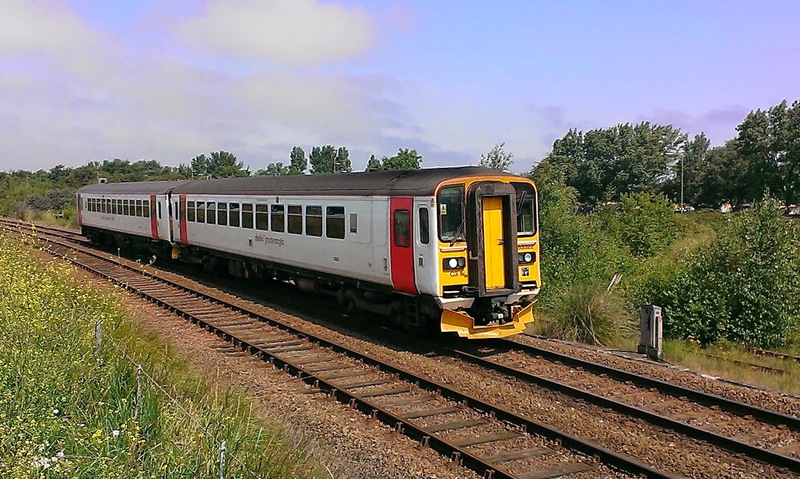 The service starts in Beccles, and continunes to Yarmouth and eventually Norwich. But who would know from this destination? Now look at the destination - it doesn't even mention that it goes to Lowestoft. At Wrentham, which is only 3 miles from Kessingland not even the timetable at the bus stop says it carries on to Lowestoft and Yarmouth. Small wonder no one gets on it. One long route, 3 route numbers and 3 destination screens. Why? 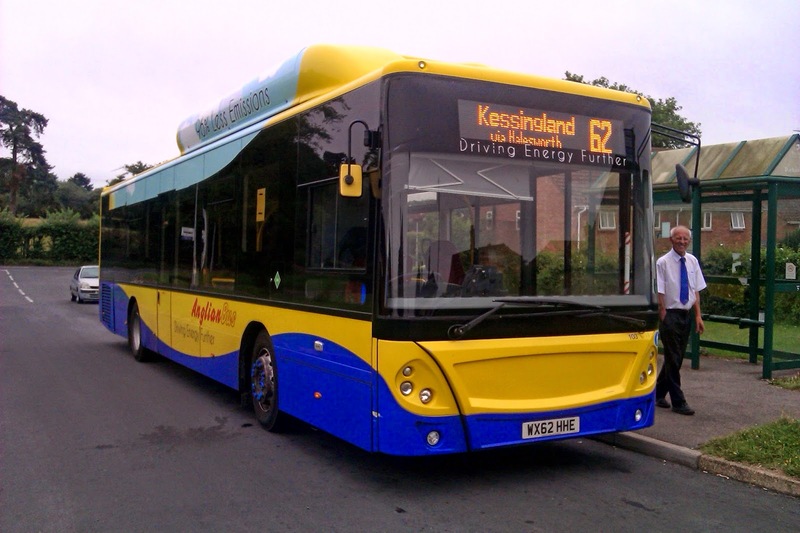 (Yes I know between Beccles and Kessingland it is Council sponsored but the passengers don't care less about that.) The domestic and EEC rules apply to drivers hours and other things that should have no impact whatsoever on passengers. The passenger getting on a bus will not give a monkey's if the driver is using a tacho or not. They want clear, concise information, and forcing companies to split their routes up is now bordering on the ludicrous. They allow through fares but not through destinations. Why? When is common sense going to actually make its way into things? And so to the X1. Or what remains of it. I listened to a woman at Lowestoft this morning on the phone having great problems getting information about the X1 and how to change at Norwich. Even after asking a driver she still thought that it was only a driver change at Norwich and she stayed on the bus for Kings Lynn. Trouble is there is absolutely no indication that you can still get to Kings Lynn, The Timetable on the stand only has it going to Yarmouth, and even the destination screen seems to indicate you have to change at Yarmouth. We need long bus routes again. We need convenience and easy to understand information for passengers. We were told this is only a temporary split of the X1 so I cannot say as a route it's dead. But if this evidence is anything to go by it's certainly in a coma and as usual it's the passengers who will be suffering. A route that was proudly the longest in the country now lies in pieces. As I said, a sad day. Not much to report this week fleet wise so I will lump it all under one heading. A quiet week. Only one arrival back at Ipswich with E200 44519 back in the new livery - I think it suits them more than the Solars if I'm honest. 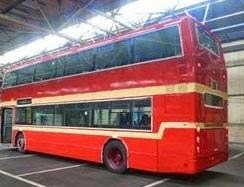 Ex Norwich B7rle 69011 has gone up to Rotherham for its makeover. As far as I know that's it for Ipswich. At Yarmouth a surprise move is today's transfer of President 32200 to Norwich. No idea why that is, but if my calculations are correct in the last month Yarmouth have lost 32200 and 37562 to Norwich, and 37572 to Lowestoft with only 32629 being an addition. This can only be good news for the longevity of the Olympians. On that subject withdrawn 34112 has apparently been yielding more parts to keep 34109 on the road so hope to see her back on the road shortly. 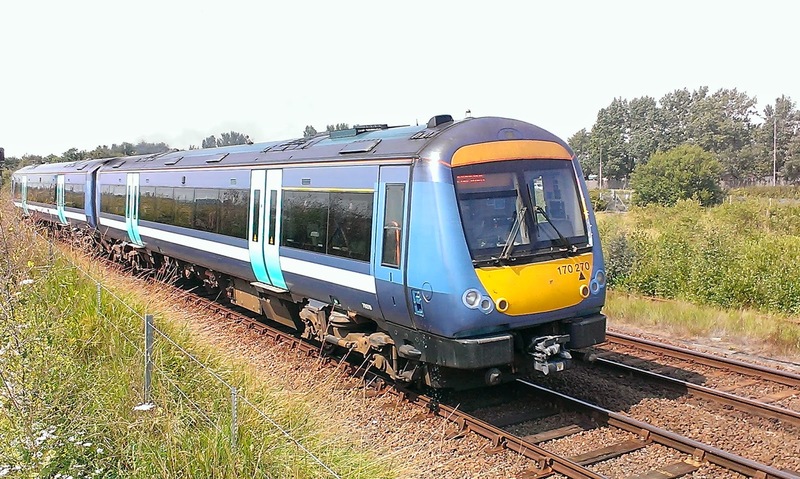 The X1 Blog reports that the 7 E400's transferring to Yarmouth will be 33818-24 although that is still to be confirmed, although I have a feeling a few other bloggers will be camped at Caister Rd today to find out! 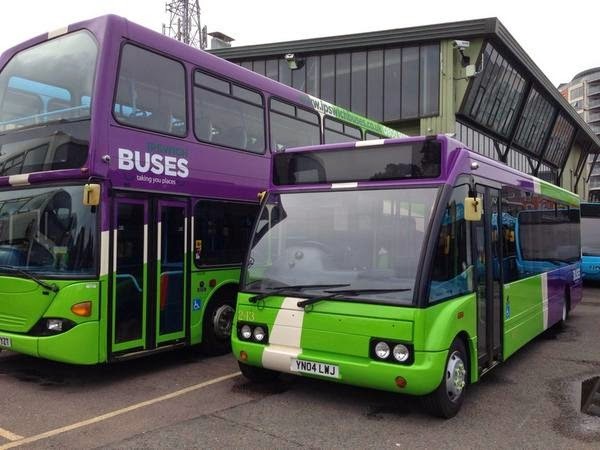 As previously reported Borderbus have increased their fleet with 3 long E200's starting service this week on the new 146, and an additional short version has been acquired as cover for both the 146 and 521 so regular maintainence work can be carried out on the rest of the fleet. Today sees the X1 split come into operation. A 20 min service will operate between Lowestoft and Norwich with the present 30 min frequency continued between Norwich and Peterborough. 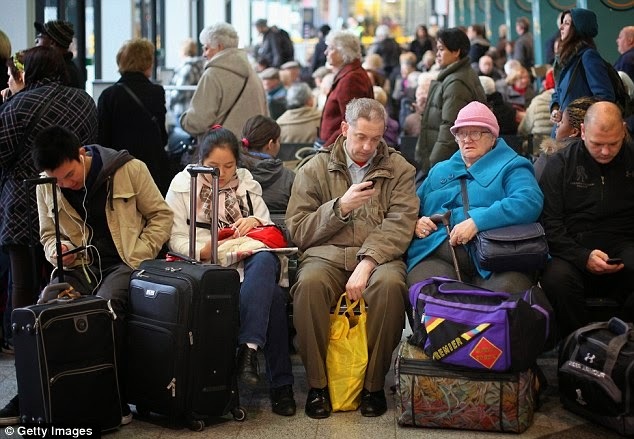 Through fares are available but it should be noted by anyone planning to travel that CONNECTIONS ARE NOT GUARANTEED. With delays possible on both sections of the route careful planning is needed. 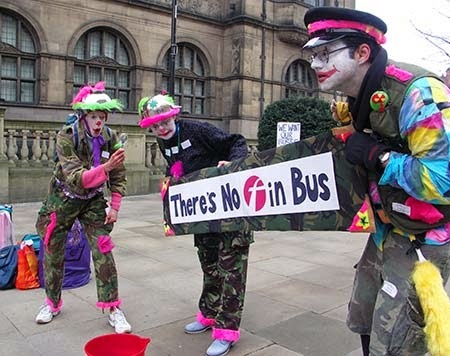 Borderbus have launched their 146 in a fanfare of blog bugles and it seems to have been received favourably, not least by this blog. I still think, though, if the route is to be a success a better PM schoolday timetable is needed as a route that basically operates during school hours only isn't going to win many regular travellers. 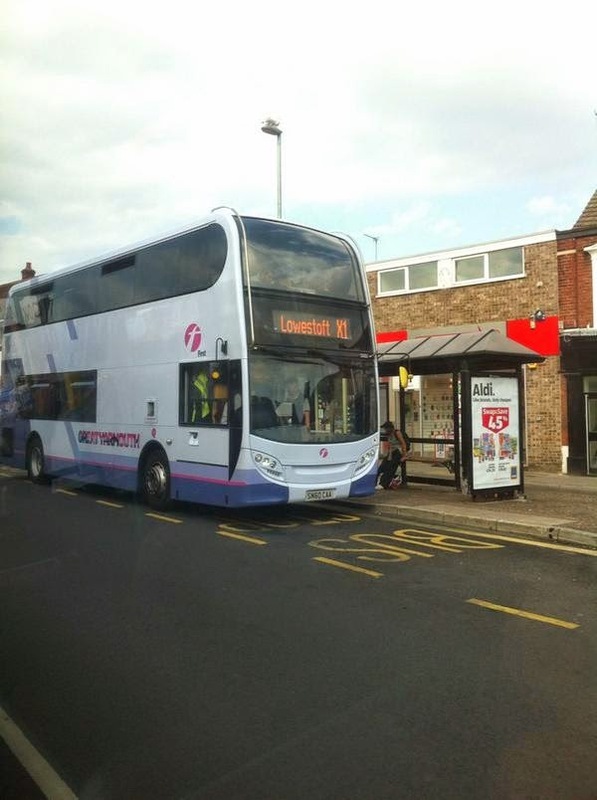 Ipswich Buses have started their Sunday Route 33 to Felixstowe today. It was rumoured that first would retaliate by using Routemasters on the 75, but since those vehicles were deemed not fit enough to operate to Hemsby this year I can't believe hammering up and down between Ipswich and Felixstowe will do them much good either. The regular open top bus tours operated by IB also start today - in Felixstowe!!! All eyes are now on the usual multitude of timetable and route adjustments that herald the start of every school year. Worth keeping an eye on the Suffolk On Board website. Is there a Norfolk equivalent btw? That's it for this week. I'll be around tomorrow in various places so if you're around tweet me and I'll try to meet up. Back in the early 80's, when I was a regular passenger on Invictaway, using my beloved Explorer ticket to get here there and everywhere there was a right royal battle up and down the M40 from Oxford to London. The NBC Oxford 190 was up against Oxford Tube and I sampled both. Fast forward 30 plus years and not a lot has changed. 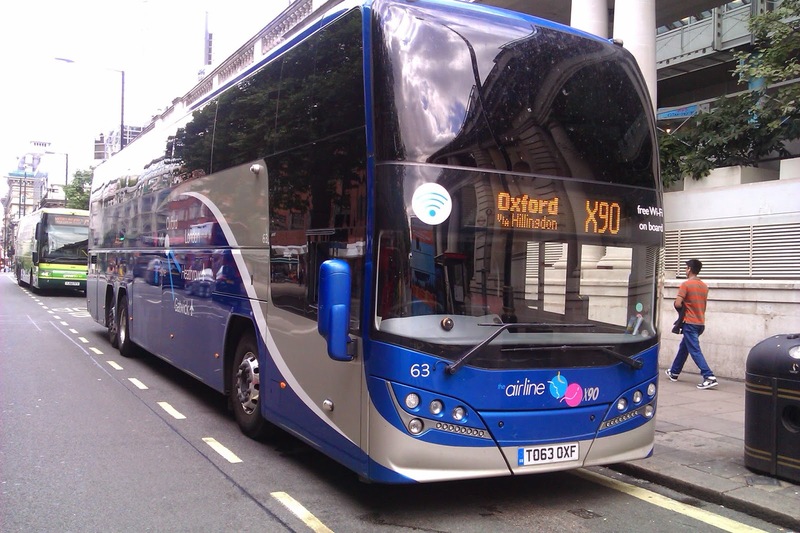 There is still a battle for the Oxford passengers so while en route to and from Edinburgh this week I took the opportunity of getting some pics, and top of my wanted list were the amazing new Van Hool coaches that have just entered service with Oxford Tube. I wasn't disappointed and a friendly driver even let me have a look round one and take a couple of interior shots. The roofs are amazing upstairs, although I'm not sure how good it will be if the sun is shining straight down on you. Snow would look great though! Having said that the opposition haven't exactly got heaps either. 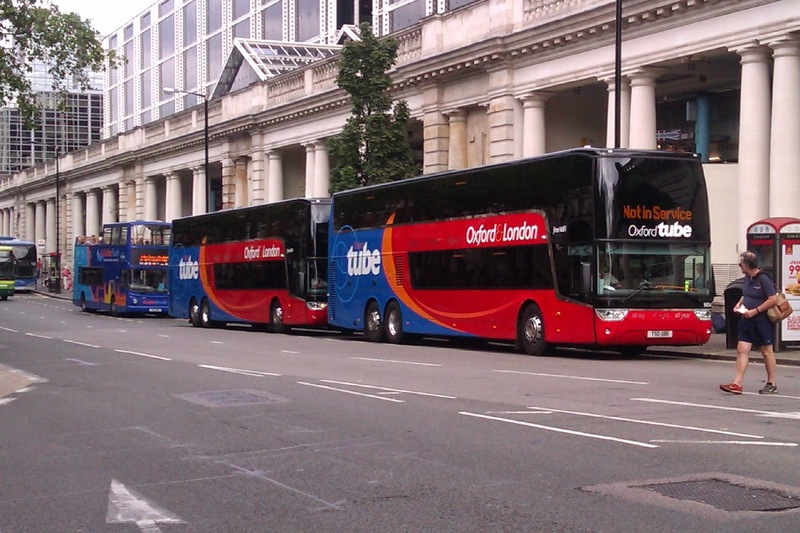 Oxford Bus operate a fleet of Volvo B11R Plaxton Elite Interdeck coaches, similar to those operated by Megabus. Have to say the people of Oxford are spoiled for choice! 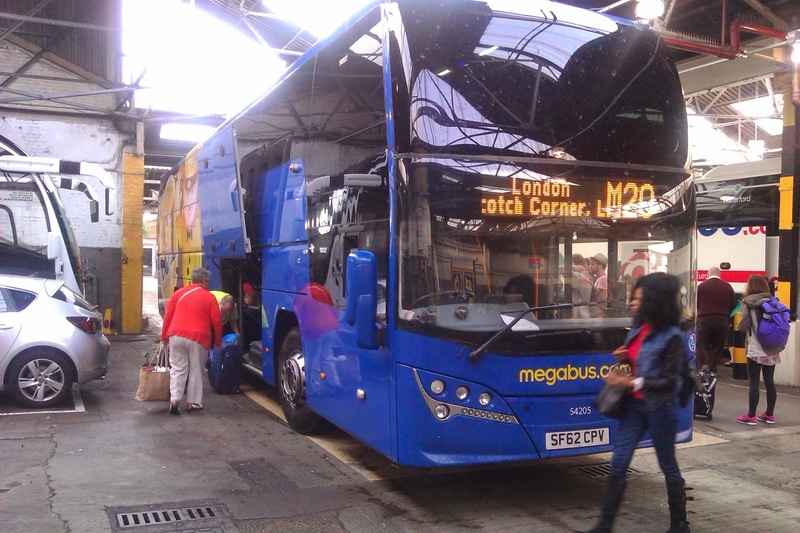 Just one thing - I had two journeys on one of Megabus's Interdecks this week for a total of £14, and I went a lot, lot further than London - Oxford which would cost me £13 day return even with my pass. So I think I should appreciate that by posting the best pic I have of one of Magabus's examples - I can tell you it's 54204 which I should have had but didn't in the end due to delays elsewhere (I had 54209 out and 54205 back). Unfortunately it's one of those pics someone just has to get in the way of but I don't have a better one. Incidentally those monsters have 71 seats upstairs and 3 behind the driver. No she didn't get squashed although it would have been justice for getting in the way! I gave Borderbus's new 146 service the ultimate test today - not only are they E200's but it was at the end of a marathon 14 hour journey down from Edinburgh! 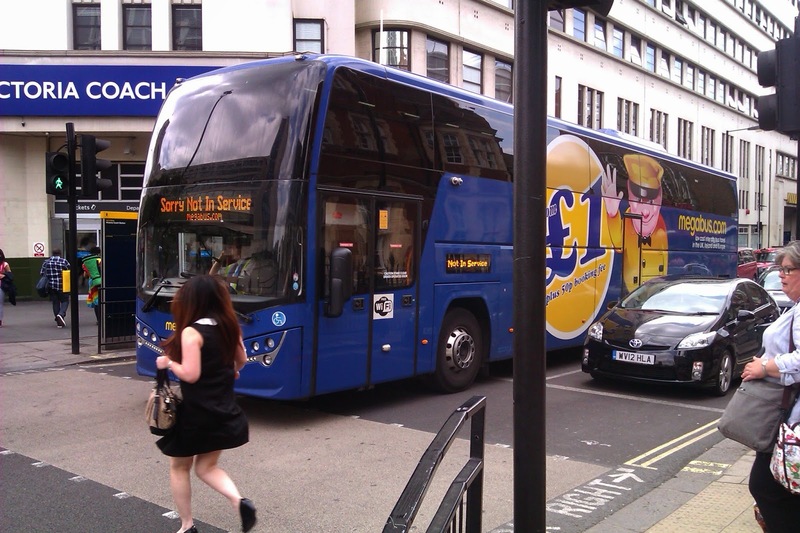 It started late last night when I caught one of Megabus's really eye-catching and comfortablle Interdeck Volvo B12 coaches down to London, arriving at 0750 (10 mins early) this morning. That is always an endurance test, but I survived! I had allowed a 90 min window into the schedule to allow for late running before catching the coach to Norwich. What I wasn't banking on was the Norwich coach turning up and not leaving for an hour - I asume for the driver to take his statutory break. That meant some raw fingernails and constant clock watching sweating on my connecttion at Norwich. 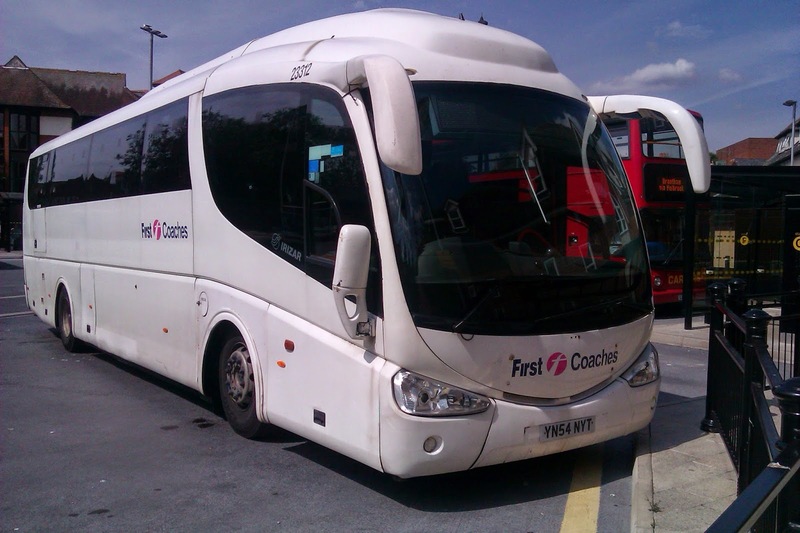 However I have to say a word about the coach Freestones used on the service. It was my first taste of an Iriza and after the Levante I suffered on Tuesday this was a revelation. Quiet, smooth, comfortable amazing legroom, not a single rattle which for a 6yo vehicle is good going and not bad looking either. Plus only £4 for the pleasure. It was quite useful I had arranged for Suffolk Links to pick me up from Wangford so I could sample the new Borderbus 146 service. After I had found the correct stop which has been re-numbered since the timetable was published, and had a quick word with Sam B.W. Larke from Norwich Buses - who told me not to expect too much of a quiet non rattly journey - up rolled, to his surprise BB62 BUS. So I fought through the crowd and with 3 others got on! Now I don't like E200's - it's no state secret. However, this has to be the best example I have been on to date. I thoroughly enjoyed the journey, the timetable means there is no belting around chasing your own tail like some routes are these days, and I will happily do it again. I was somewhat surprised to be the first ot get off at Wangford, but thanks to the driver who waited for me to get this pic. Now obviously although it doesn't rattle right now we all know that after another week it will be rattling insanely - it's par for the course. So here is something I have yet to see elsewhere (I'm NOT using THAT word!!) I was told. It was reported by King Roy on East Norfolk Bus Blog that the human camera drone that is Tim Miller had spotted a 4th E200 looking as though it was heading for Borderbus. Well guys you are right. It IS going to be a 4th (well 5th really if you include the baby on the 521) E200 for the 146. That is so every month or so all the E200's can spend some time having everything tightened up so ensure they stay rattle free as much as possible. Mr Pursey and the Borderbus team have every plaudit I can summon up for that. Yes, the timetable fits the public in around more lucrative school contracts, but if that maintenance regime really does happen (and I'll be chacking) then it says a heck of a lot about Borderbus and it's attitude to passengers, and my word doesn't it say a lot about Alexander Dennis too. To need a spare vehicle purely to stop the others falling apart is a shocking endictment, but backs up everything I've banging on about with regard to E200's, so Borderbus - you're now my favourites!!!! Another week has past, ending rather spectacularly with lightning storms all over the place, and it's time to round up the week's news again. 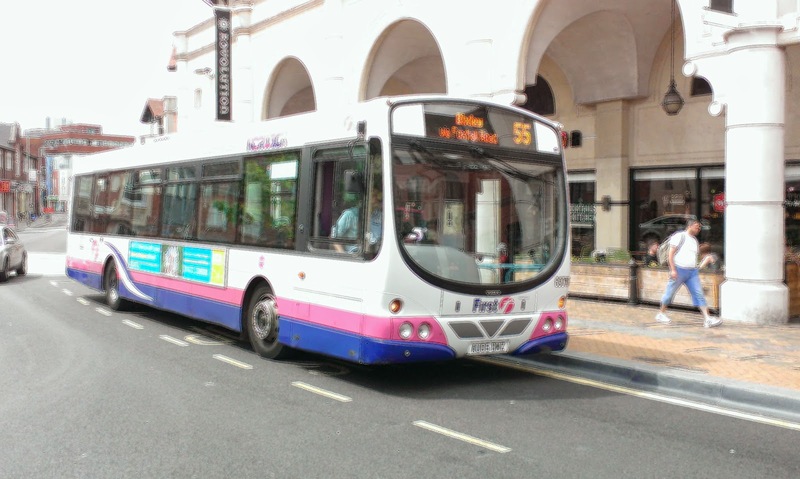 We start in Ipswich where there are now 4 B7rle's running around in the new livery unique to Ipswich. 66850 and 69009 have joined 69008 and 66981 in sporting that rather dubious dark grey-green front. Also expected this week was the eagerly awaited ALX400 32479 which is coming back in the Eastern Counties post box red livery. However there have been a few delays and it will still be sometime before she returns. But we were given a preview on Twitter yesterday and I can't wait to see the real thing. 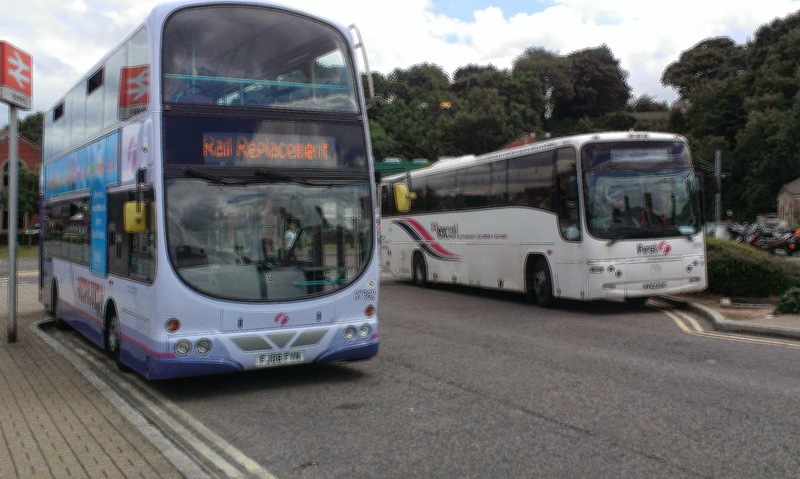 Also in Ipswich this week as reported on this blog were much travelled Volvo B7 Gemini 37562 and ex X1 Paragon 20515 on Rail Replacement standby duties. 37562 to be replaced by 20514 after MOT, and two further vehicles, on loan from First Hampshire in Southampton, Scania Iriza's 23312/4 will be used on the 5 week contract. Still in Ipswich and Ipswich Buses announced on Twitter this morning that they have repainted one of their Solos into the new livery. Not sure I like it on them as much as the bigger buses but it will grow on me. It has been a quiet week elsewhere. At Yarmouth Olympian 34186 is ready for service again after a gearbox donated by the now deceased 34187 was fitted. It's the last week of the X1 as we know it. This time next week the Norwich Wall will be in place and there will be no through services for at least 18 months. Let chaos and inconvenience reign. 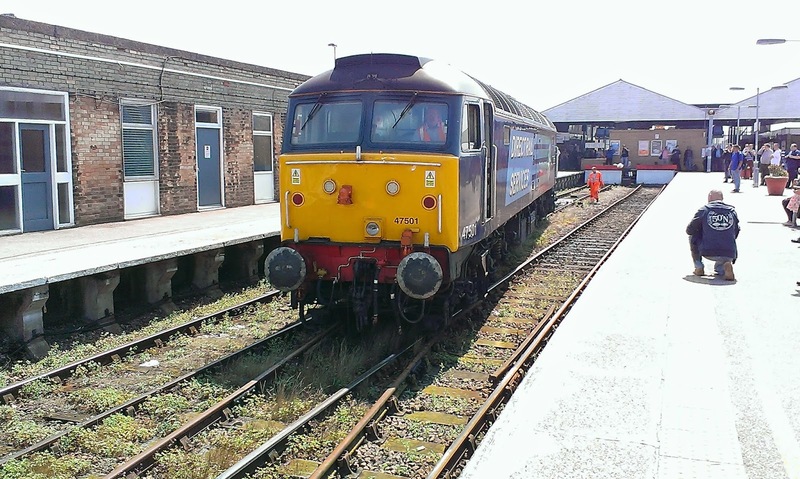 So the last chance to snap those long distance destinations at Lowestoft and Yarmouth. Borderbus's long awaited 146 starts on Thursday. I'm out of the region most of the week but am hoping to incorporate a sample into my return journey on Friday. 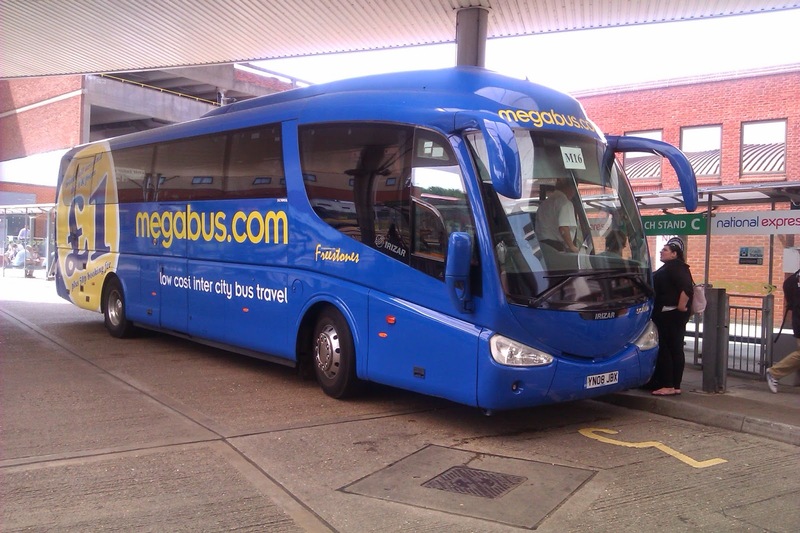 I am also hoping to get on a fleet of gas buses up North for a review next weekend, as well as more Megabus pics and with any luck the new Oxford Tube fleet plus more. Keep checking in. On the trains Greater Anglia have still had many problems this week. The system is crumbling, and the main fiasco this week was on Friday evening when all Liverpool St - Shenfield Metro services were suspended because numerous trains had suffered pantograph damage. Yesterday and still today lightning damage at Brundall meant a very limited service to Lowestoft and Yarmouth - on a Summer Saturday too! And of course there have been speed restrictions because it has dared be Summer. Our rails don't suffer the extremes of temperature countries like Poland or Canada do, yet they freeze in winter and melt in Summer. Simple question - why???? How do Indian rails cope with the heat? On a fleet note you may remember that a few weeks ago I went to |Dereham to take pics of stricken loco 90010 before she was taken by low loader to Crewe for repair. Well she came back this week, repainted into GA livery. No pic yet but will do my best at some point. 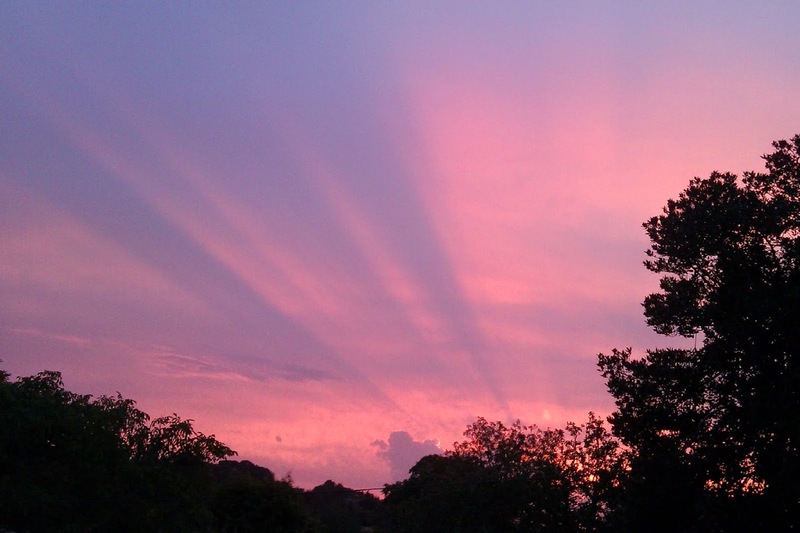 Sunset over East Suffolk last night. Just a couple of things that have caught my eye today, and I now have an excuse to go down to Kent before Summer's over and see my parents. Not that I need a reason to see them, but I now have one. 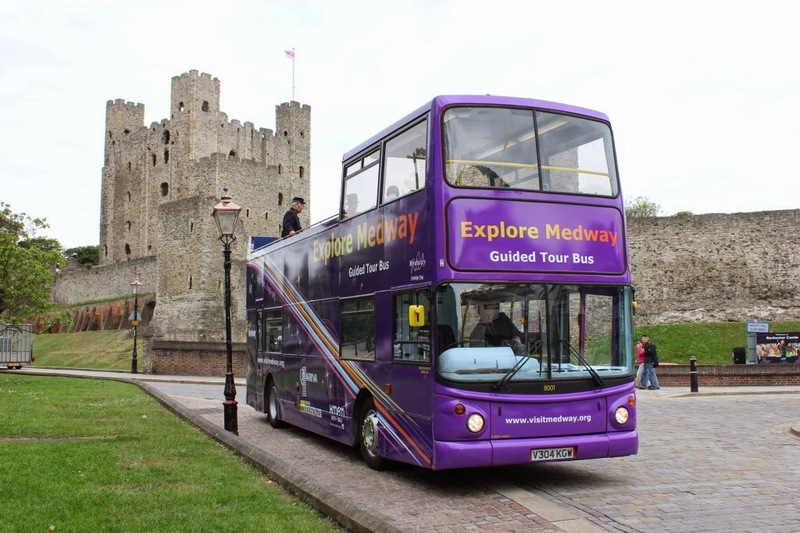 Thanks to an old friend and Twitter I can reveal that the Medway's Big Purple Open Top Bus Tour is in operation again this year. Now what is so remarkable with that you ask - it's only a purple ALX400 after all. Well I'll tell you! In this case it's not the bus but where it goes and in particular who is the voice on the tour. The bus takes in Rochester Cathedral and Chatham Dockyard and the tour is voiced by no less than Brian Blessed. I can just imagine that booming voice re-enacting battles from the past and relating stories of press ganging and revolting peasants I mean peasants revolting! I'm laughing already at the thought! Secondly today I have discovered a rather addictive website that I'm sure most of the rail enthusiasts know about but I didn't till last night. I keep breaking off from writing this post to watch the railway at Dawlish (sea crashing nicely over the wall) to watch the trains go past on the live camera there. Even has sound of the sea on this hot day. You can access this and other cameras around the country (not many in our region) by clicking here. You will have to register which will take a few hours to be processed but well worth it! Now how about a live cam at Norwich Bus Station or Tower Ramparts! 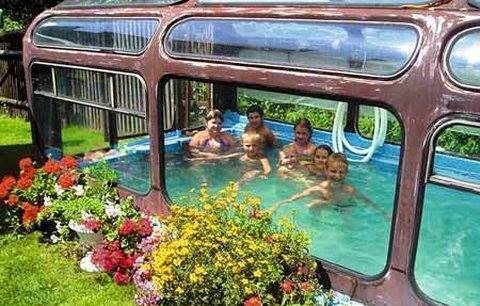 Finally today thanks to Bakerbus and Twitter I can bring you a pic of the most ideal way to use a bus in this heat. I assume it used to be a bus and not a rail carriage but you will all want to get inside it today anyway. Here's to some decent lightning tonight! Just needs a bar and it would be perfect! A new feature I'm going to introduce to SB&TP is a regular (sometimes) look at what's happening in different areas, both on roads and rail. I know some of you aren't concerned with anything outside our area but I know there are just as many, if not more who find it interesting, so this is for you. 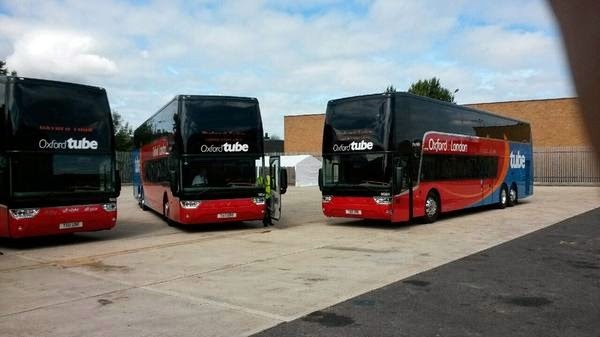 We start in Oxford where Stagecoach's Oxford Tube has launched a brand new fleet of Van Hool double decker coaches. The new vehicles entered service yesterday and key features include high speed 4G WiFi, extra leg room and panoramic glass roofs. They look pretty stunning, and hopefully I'll get some pics of one or two of them while passing through London next week. For the full report and vehicle description go to the Oxford Tube website by clicking here. Staying with Van Hool, and also partially Stagecoach we head North, way North to Aberdeen, where final preparations are in place for the launch of 10 hydrogen buses operated jointly by Stagecoach and First. These Van Hool monsters are due to hit the streets in the Autumn, and I have to say it just might be worth a trip up there for the braver of you as they look pretty amazing to me. You can read Bus and Coach Buyer's full report by clicking here. So next time, like I was this morning you are feeling sorry for yourself on a hard seated Scania just hope that one day these find their way down this neck of the woods too! From Scotland to Wales and Arriva have launched their latest Sapphire service in North Wales. Operating between Rhyll and Aberystwyth the service 12 has a fleet of brand new AD E400's with all the trimmings. 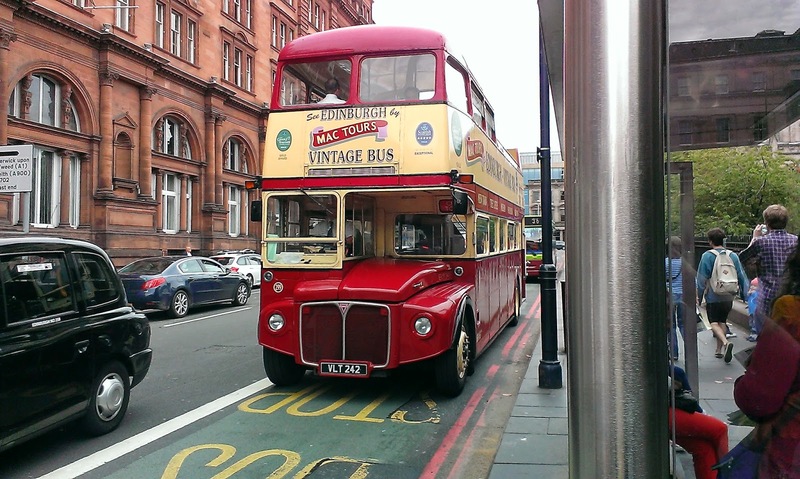 A full report is on the North West Bus Blog, which is certainly worth the read and you can access it by clicking here. Our last bus related item today is just an excuse for an Olympian pic. 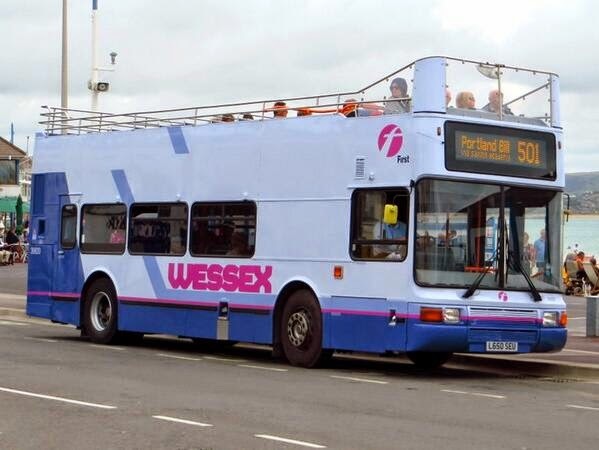 First Wessex launched their Summer 501 Service between Weymouth and Portland \Bill lighthouse last week, and are using this rather good looking Olympian on the service. If anyone is down in that region this Summer it's got to be worth a ride! And finally Freightliner have announced on Twitter that all their Immingham coal services are going to operate via the Grimsby Light Railway due to the derailment of a DB Schenker Class 66 loco. I have searched for more info on this incident without any success. However the pic below accompanied the Twitter post and really only has one caption available. Everyone is getting used to IB's new livery, and I have always liked it. The Darts look as good as anything else in the livery and the route branding is subtle and not in your face. First's new livery for Ipswich could well be an accquired taste. 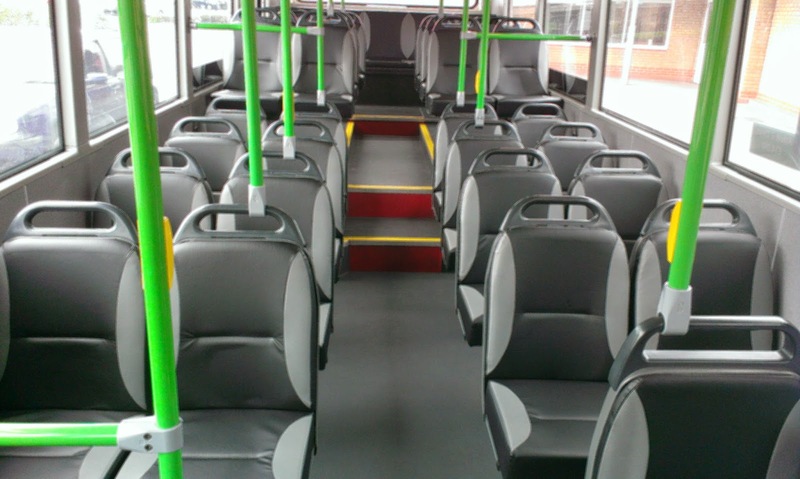 I did a small survey of staff and a few passengers yesterday and general concensus seems to be - those that were printable - that no one quite understands why First chose that dark charcoal green at the front. Ipswich Town blue or Eastern Counties red would at least have had some relevance. However I will give it time to get used to it, but I can't help thinking that if it looks dark and dirgy on a bright Summer's day what will it look like on a dark, January evening. This is where you have to feel sorry for First. 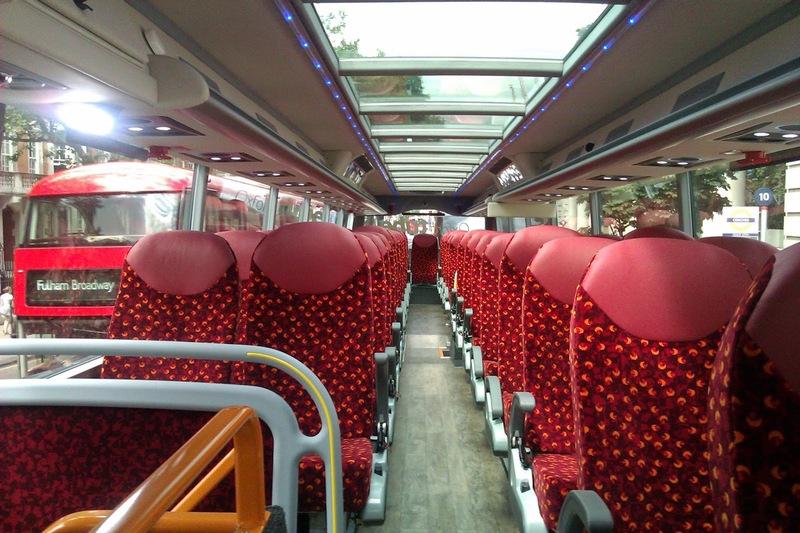 In all my years both as passneger, driver and enthusiast I have never known bus interiors as consistently well turned out as those of Ipswich Buses. They also look clean, smell clean and can't be faulted. There is absolutely nothing wrong either with the interior on the B7's although some of the floor trim looks grubby already. IB's seats look nicer than First's, but in this case my bottom gets the casting vote and the most comfortable seats are on the B7's. I don't like Darts. I've never liked Darts. I like Darts as much as I like E200's. Even those Millenium Darts with the better soundtrack as IB87 has are still Darts. That gives First a head start ion this category. However I was in for a surprise. The team at Hogwarts have waved a few wands, recited a couple of incantations and concocted a few potions and as I type IB87 is virtually rattle free, There must have been an awful lot of tightening up as the last time I went on one of those I was shaken out of my seat. However I fear the roads around Bixley and particularly Broke Hall will ensure that it will be rattling again before long. Get the roads resurfaced and the buses will last longer. The B7 has had no such attention, and although 66981 didn't rattle much anyway there was no obvious change to the ride quality. However the meatier engine noise and solid feel to the bus make it honours even in this category. IB's WiFi is the best I've used - including Megabus. I had forgotten to test it and was already by the university campus by time I remembered. Less than a minute later I was online and everything worked. 66981 isn't fitted with WiFi yet. I just hope it's a different system to the X1 whch I find very long winded and tiresome. I feel that both companies deserve credit here. Beauty is in the eye of the beholder, and the fact I'm not sure about First's new colours is neither here nor there. One driver said the new colour would have suited the rear of the vehicle better but I'm not sure I agree. I would like to know, though, the thought process behind the choice of that colour. The leather seats look good on both vehicles, but I agree with the IB driver who was lamenting a leather driver's seat - that will get hot and sweaty this time of year and cold in the winter. The 4 isn't direct competition to the 66, but an additional service that will benefit different people. I quite like the route, although I'm not sure it should run circular around the Town Centre. I know most routes do, but it is awkward for shoppers having to board to go back at different points to alighting. 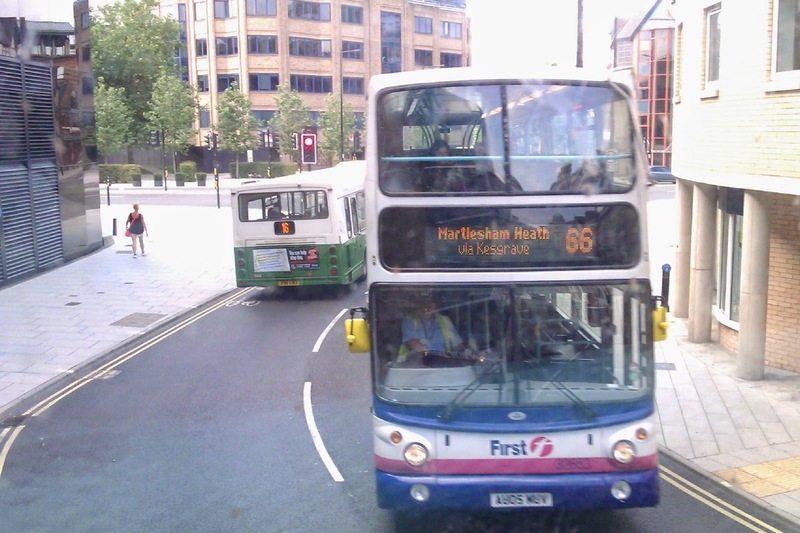 If you live in Ipswich you are lucky as far as buses are concerned. Both First and IB are doing their utmost to improve their vehicles and they are succeeding. I can't even say new vehicles would be better as if recent experience is anything to go by I'm not suire they would be. It's too early to judge the legacy of all these refurbishments, but they are giving it a go - First in particular - and maybe we need to wait 6 months before drawing any firm conclusions. One last thing - while at Chantry I saw a 4 branded Dart operating on the 13. That is why I am against bus branding! Sorry no more pics but my camera was seriously misbehaving yesterday and they are rubbish! Tomorrow I'm going to have another of my comparison posts - this time comparing Ipwich Buses refurbished Darts on the 4 with First's refurbished B7rle's - don't miss it! However there was a lot more to see in Ipswich today, and we start with the Norwich infllux. Well publicised yesterday was the appearance of ex Everywhere Gemini 37562 and ex Yarmouth Paragon 20515 at Ipswich Station on mystery Rail Replacement work. Well a mystery no longer. Having spoken to a driver I can reveal that they will be there on general standby from 0600 till very late for the next 5 WEEKS!! I can only assume Greater Anglia are taking no chances with the forecast hot weather, or the way the network fell apart last week mainly due to Notwork Rail's incompetence. No idea if those two vehicles will remain, but they are crewed by Ipswich drivers and I presume stored at Ipswich overnight. I must apologise for the quality of the pics in this post - I have no idea what my camera was doing but certainly not taking good pics. I'm due an upgrade and it can't come quick enough! 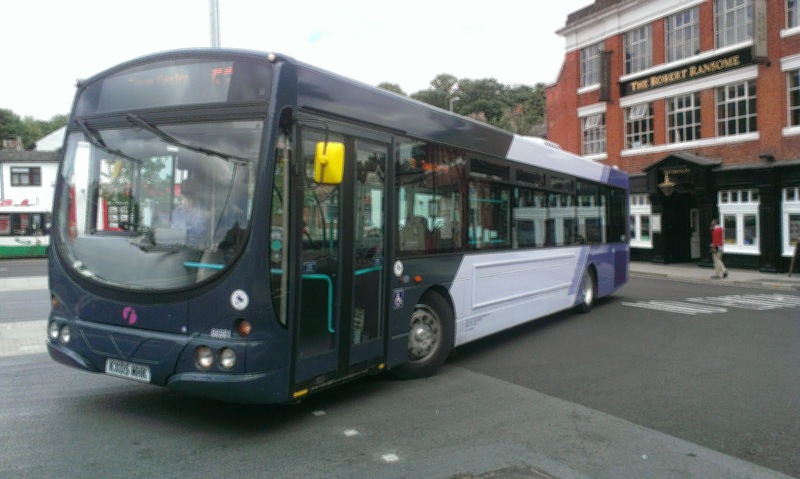 Anyway here is a taster for tomorrow when I'll be comparing the refurbishments on Ipswich Buses and First, having travelled on examples of both today. 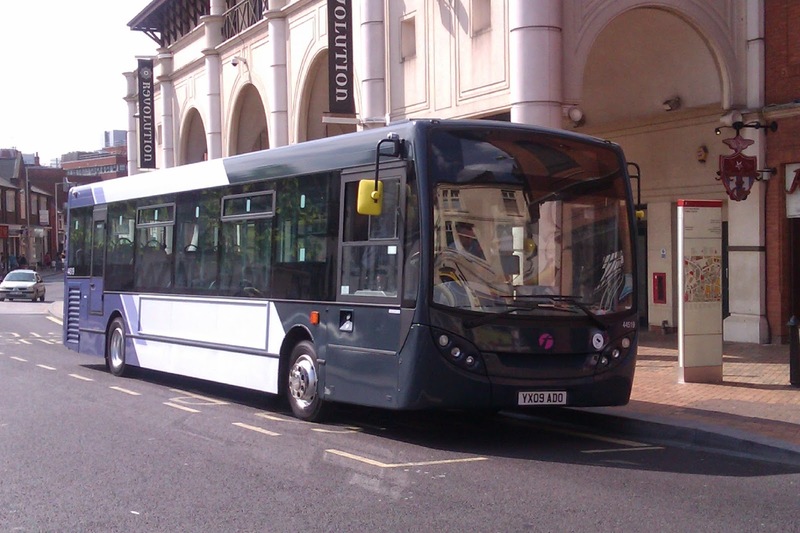 I can also show you my own pics of the new First livery for Ipswich, on which more tomorrow. A new interior (and better pic) but on what? First Essex Colchester's depot seems to be a magnet for would be bus joy riders, and Colchester's Daily Gazette reports another incident in the early hours of Monday morning, when ex Ipswich Scania 65631 was taken from the depot. Witnesses saw it smash through some gates and reach a standstill by a block of flats. First have confirmed the incident and said the vehicle was undamaged. For the full report click here. No not the German football team, but those magnificent men in their fitters overalls at First Ipswich. I predicted when ALX400 30888 was transferred to Ipswich the first thing they'd do would be to sort out the permanently roaring fan. Well ladies and gentlemen, particularly those of Great Yarmouth who have suffered for so long with perforated eardrums in Market Gates as 30888 has roared through, I present to you the new, silent version as created by Barry Spurling and his team - one of whom told me rather bluntly today it hadn't been the easiest of jobs! 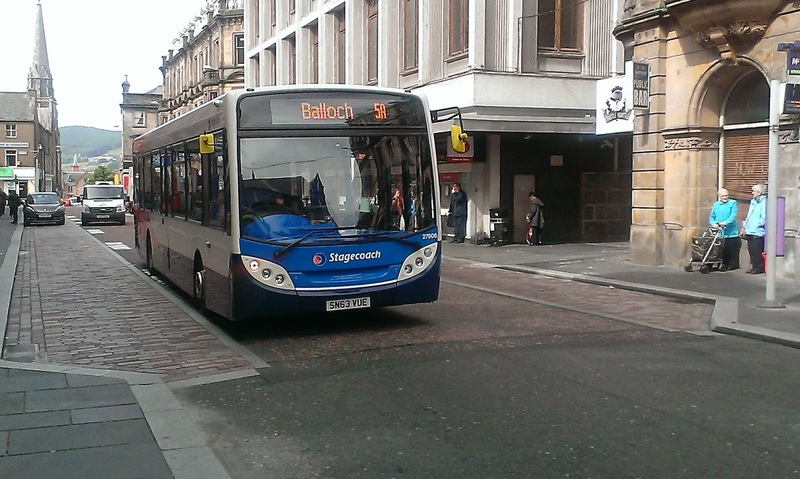 I caught the 1030 from Sax today, the one that caused the post last week that has generated a record number of comments. It was bang on time, stayed bang on time, but was remarkably empty for a Monday. 66112 was the chariot, driven well and gave a decent ride. Just thought I ought to mention it to placate the Mr A's of this world! Not the best pic in the world but 66112 sits at Wickem Market on time today! From now on I'll be rounding up the week's news every Sunday, rather than scrabbling to give it to you as it happens. This suits me, and I feel the blog better, as readers can just check in every week to see what's been going on. Of course there will still be plenty going on during the week, but that will concentrate on my own travels and experiences. Most of the attention this week has centred around Ipswich, with the return of two refurbished B7rle's in the new livery. Reactions to the "charcoal blue" front have been mixed to say the least, but as yet I have not seen one in the flesh. I guarantee I will this week and will publish the pics I take. This week ALX400 32479 is due back in the Eastern Counties heritage livery so I'm looking forward to see that. 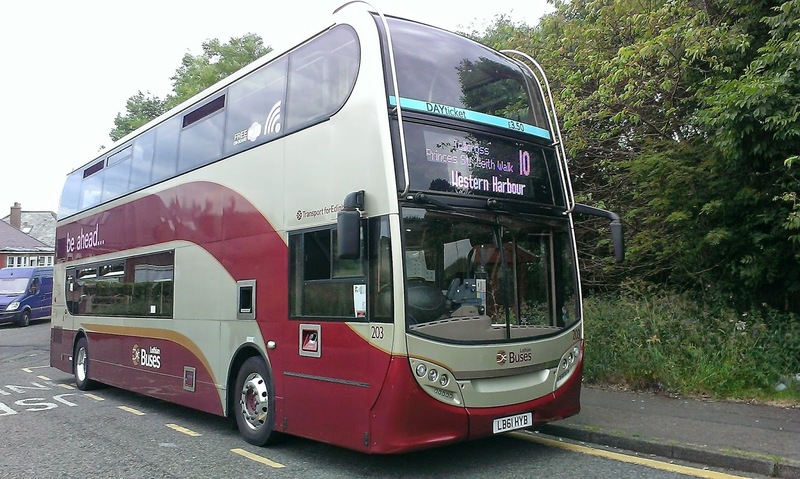 Ex Norwich B7rle 66950 has now departed for Rotherham as has another of the E200's. 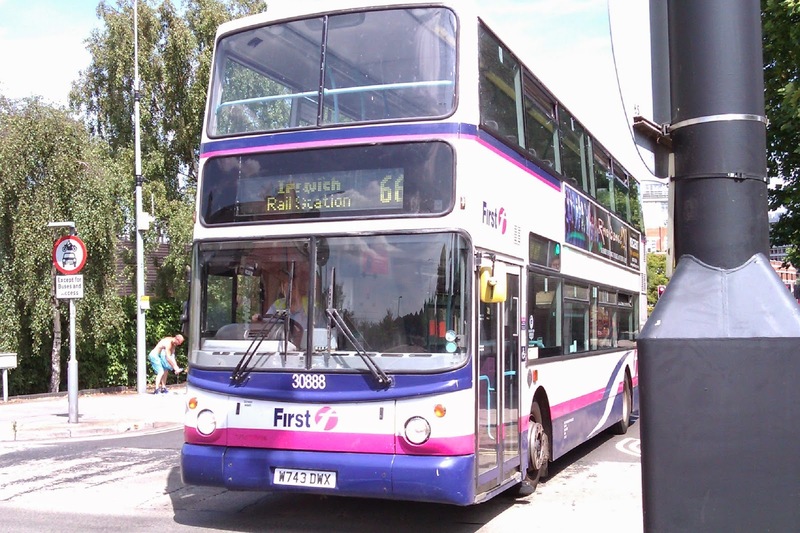 First Ipswich have also been awarded two new Sunday contracts - the 65B to Woodbridge and the 116 to Debenham. 3 journeys each way starting on 3rd August. 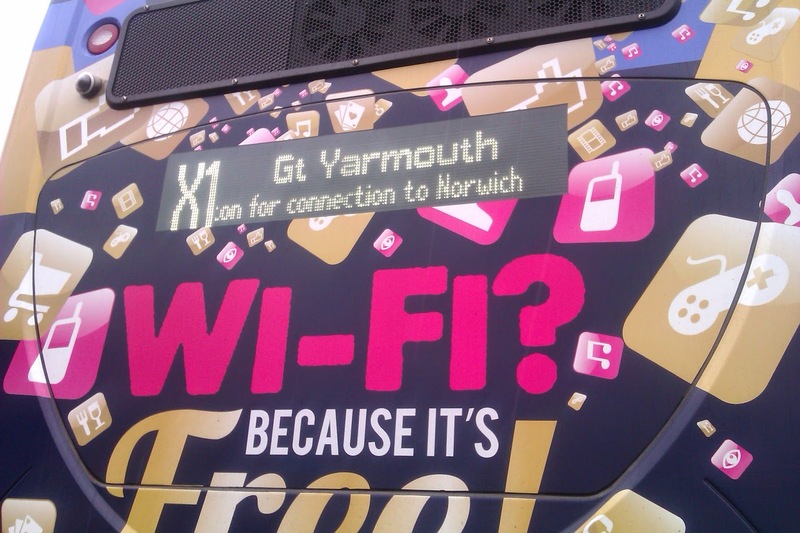 Great Yarmouth have installed WiFi in 5 of their vehicles in preparation for the X1 split. Former X1 Geminis 37573/4/6/7 plus jewel in the crown E400 33423 (God she looked good yesterday) have all been fitted with the facility as they will be in regular use on the X1 between Lowestoft and Norwich. I have also heard that Yarmouth are looking forward to getting shot of some of their Presidents. The timescale is unclear, but I'm sure those without concrete backsides will let out a cheer when they leave Caister Road for the last time. Olympains 34114 and 34186 are expexcted to re-enter service this week. A gold star to the first person to spot an Olympian on the X1 after it splits! Not too much to report from Anglian this week. More of the gas buses have had all the vinyls removed, except the ones covering the gas tanks, and some have had the new logos applied. They look better to the naked eye than they do in photo form, as light grey on yellow just isn't photogenic! I noted a Solo yesterday also with the new logos but don't ask me which one as it really doesn't matter. 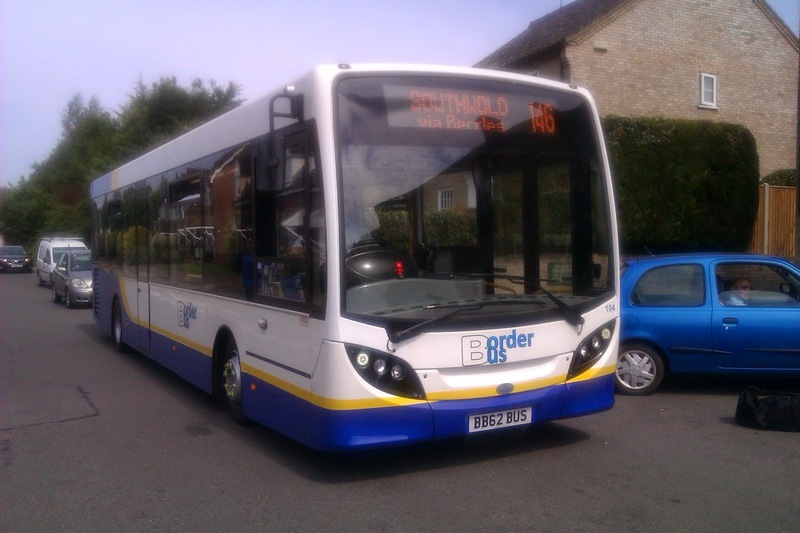 Only 11 days till Borderbus start their dual timetabled 146 service between Southwold and Norwich and it has emerged during the week that they will be using AD E200's on them. I wish them all the luck in the world with the new service but fear I will not be a regular! It has been a simply shocking week for GA. Signal and points failures, suicides, bridge strikes, train failures and high winds have all conspired to make rail travel in East Anglia this week a nightmare for passengers and managers combined. 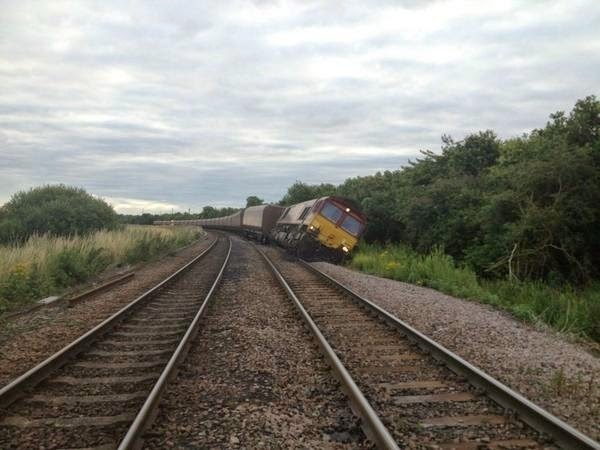 The huge amount of incidents seem to fall under the juristiction of Network Rail, this week fined a record amount for their incompetence, and it is worth remembering that Greater Anglia have no more control over the state of the track, signals and points than First and Anglian do over the traffic flow in Lowestoft. I hope everyone has a better week this week. 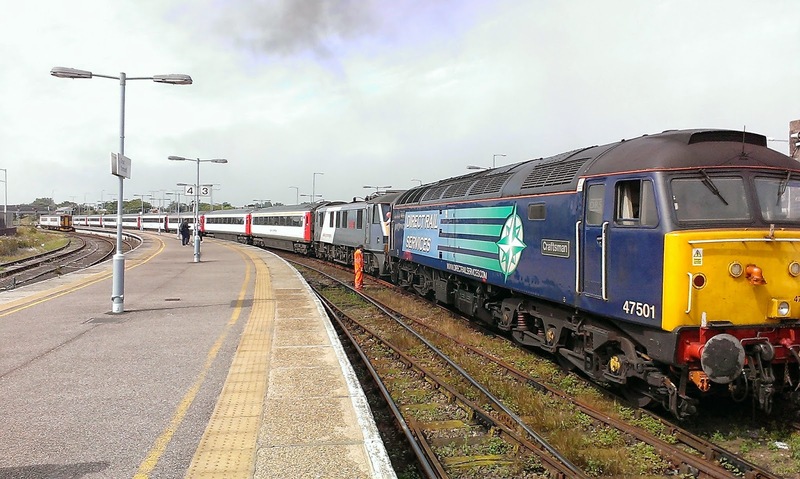 As reported in the post below yesterday saw the start of the Summer services to Yarmouth, and if the number of passengers I saw yesterday is anything to go by they will be well patronised - with enthusiasts as well as holidaymakers! 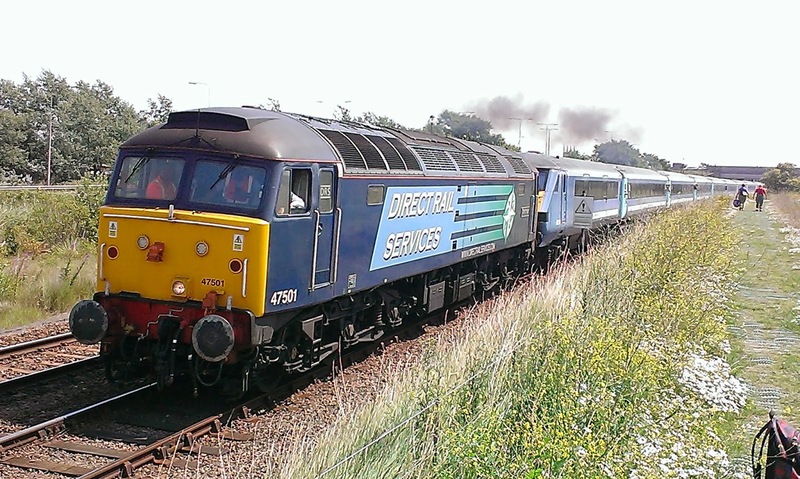 A couple of weeks ago Harry of Norfolk Scene asked me if I wanted to join him observing and photographing the first day of the Summer services to Great Yarmouth, which involve a full Mainline set being pulled by a Class 47 loco. I have wanted to do this for years so was pleased to accept the invitation. What I didn't know is Harry knew of a lineside path that gave us excellent views far away from the multitude of enthisiasts who had gathered together at Yarmouth Station. The sun came out to warm us up - really warm us up and I have to say I thoroughly enjoyed it. Got some pics I really like and next aim is to spend a few hours at Berney Arms one Saturday during the Summer getting some picturesque shots while supping a decent pint! The star of the show switches tracks at Yarmouth to get to the front of the set for the return journey. For the record Mr Anonymous First Eastern Counties have done nothing to annoy me today, therefore by your reckoning today is the first day in the blog's history I haven't "slagged them off". Put it in your diary! And so to the main event, at least it was for me. An early start saw Grace and I aboard the 0633 from Edinburgh to Perth, on the first leg on our day trip to Skye via the Inverness - Kyle of Lochalsh line. However, before that I spent a rather novel 15 mins at 6am taking pics of buses in the early Edinburgh sun - how many buses can you take pics of at 6am round here!! So off we went in the comfort of 3 car DMU 170421 on the journey to Perth. A short wait there and another 170 came in on the long jorney to Inverness, which passes through some really spectacular and changing scenery. At Inverness we had the chance of a short break so out came the camera for the most Northerly bus pic taken by a blog owner I have seen so far! 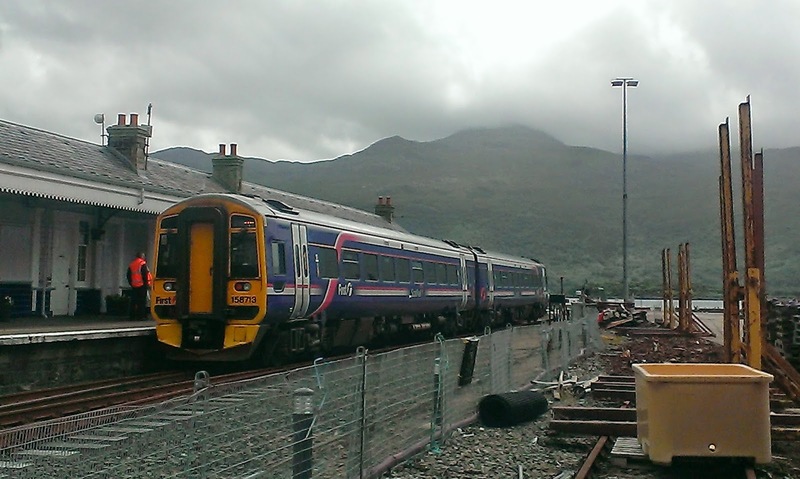 We then boarded DMU 158 for the trip to Kyle of Lochalsh, and it didn't disappoint. It is simply stunning, and it is a continuous niggle that I was 6 weeks away from a transfer to Kyle depot when my eyes gave out on me. I can't believe I would have been paid to travel that glorious line day after day. The only downside was that the weather changed while we went from East Coast to West Coast and it was a howling gale when we got there, with rain following later. 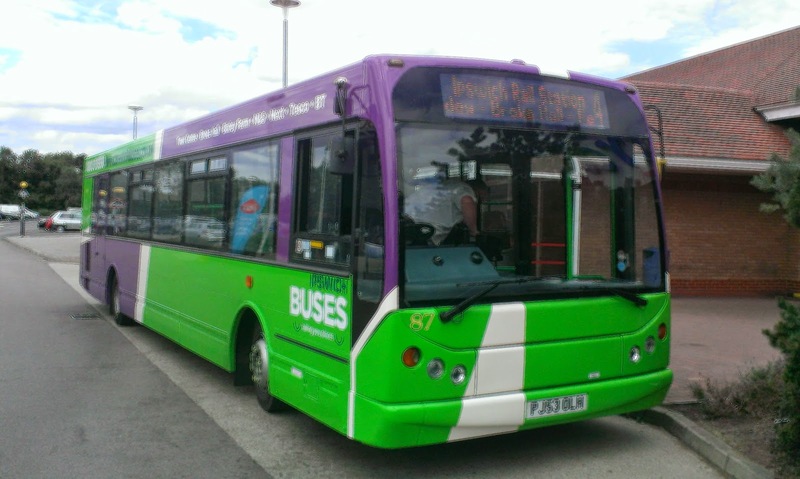 However, I still got a pic of our 158 at what is my favourite terminus in the UK. It was gone half past midnight by time we got back to Edinburgh, and I was amazed at the number of night buses in operation. Unfortunately my camera didn't manage to get a pic worth publishing, but it only enhanced my respect for the Edinburgh public transport system. The next day I rather sulkily headed back to London, this time by train, and an experience of the East Coast Main Line. No problems to report - again there was a powerpoint at my seat - Greater Anglia please note - and we arrived in Lindon on time. I was hoping for an HST set, but the Class 91 that pushed us all the way did a more than adequate job. Three companies impressed me no end on this trip. Stagecoach's Megabus service is that cheap I can see myself being quite a regular on it in the future - I already have my next trip booked. 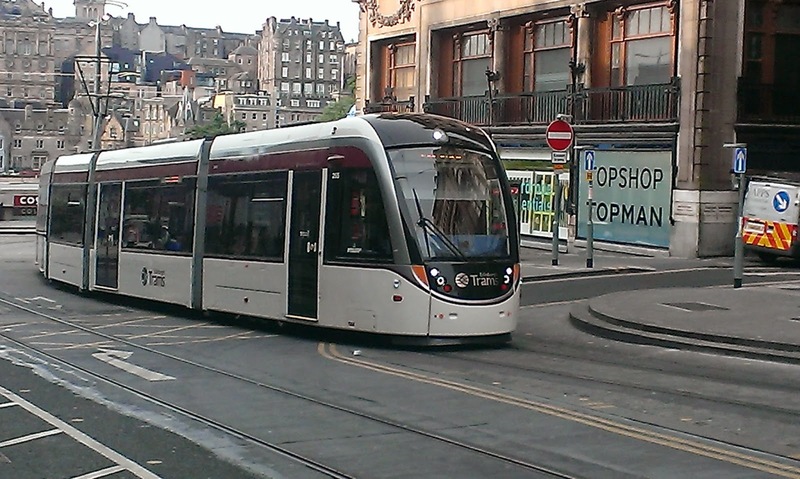 Lothian Buses and now Trams give Edinburgh a transport system a lot of places would do well to take inspiration from. Cheap - very cheap, accessible, regular and well publicised. Can't fault them. A highly varied fleet too. And finally First. First Group seem to make a better job of running trains than they do buses. Scotrail operated faultlessly for us over the 18 hours we were travelling. Clean trains, punctual trains, quality staff, great information. Just don't charge 30p to use loos in places like Inverness - pointless when you can wait and go on the train! I'll finish this series of posts with the cutest train you'll ever see. 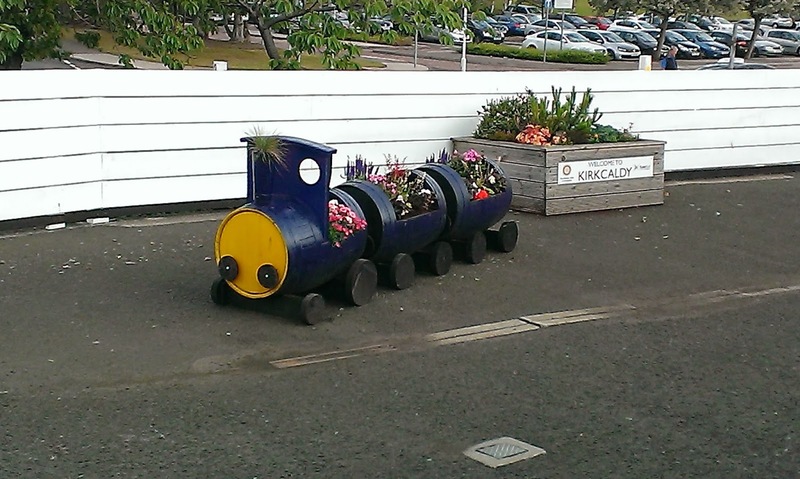 A lot of Scottish stations have them, and I think they really add something. I hope you've enjoyed this series and I hope for another one in a couple of weeks. Today I intended to go to Ipswich to photograph the newly returned 69008 in her new paint job to see if I liked it better in real life than I do in the pics I've seen so far. This was going to prove awkward as I had a minibus booked to Halesworth and had to double back. So I caught the train to Saxmundham, decided not to get on 69427 going the long way round via Aldeburgh and waited for the 1027 64 from Tesco at Saxmundham. And waited. And waited. And waited some more. Luckily there was a lady with a baby also waiting for that bus on a morning that seemed more like March than July, who I was able to talk to. So when the bus was 25 mins late I tweeted First Ipswich, who 10 mins later informed me that according to the depot everything was out and there were no probs. I replied that it was now 33 mins late to which I was offered the contact email to register a complaint and a repeat that the depot knew nothing. 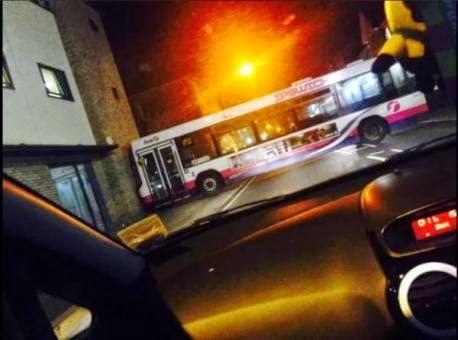 So obviously the bus was lost missing in action. The 1127 was 3 mins late, and the driver told us immediately he had passed the 1027 at Leiston where it had broken down with air problems. So effectively that was 80 mins after it had broken down and First Ipswich didn't know about it, at least that is what we were led to believe. I decided against going to Ipswich after all and caught the 196 shoebox home. That is the second time in 3 weeks that bus has failed to turn up on a route that is an hourly service. It is twice in three weeks I have known what has happened to the bus before First Ipswich have allegedly known. No tweet ever went out about that cancelled service. As customer service goes it is nonexistent. Is it any wonder their reputation is so low it would win the World Limbo Dancing Championships? I have just been looking at the new timetable for the X1 commencing at the end of the month and I'm confused. First are saying that the reason for splitting the route at Norwich is to help punctuality during the roadworks on the A47 at Postwick. OK so taking that into account here a few comparisons between the old timetable and new timetable. 1. Currently along the affected section the X1 is allowed 38 mins off peak 40 mins peak to get from Yarmouth to Norwich. After the new timetable starts taking into account the possible delays the X1 will be allowed erm 38 mins off peak and 46 peak to get from Yarmouth to Norwich. 2. Currently the vehicles operating the X1 shorts get 22 mins turn round time at Norwich. Taking into account the possible delays caused by the roadworks it seems that in the new timetable the vehicles operating the Lowestoft - Norwich section of the route will be allowed erm 8 mins turn round time. 3. Currently the journey time between Lowestoft and Yarmouth is 42 mins operating limited stop. once the new timetable comes into operation and all stops will be observed the new time allowed for the journey will be 44 mins - just 2 mins extra. It looks like the off peak vehicle requirement for the Norwich - Lowestoft section will be 10 vehicles, unless I have got the layover at Norwich wrong and in fact it will be 28 mins to allow for the roadworks in which case it will be 11 vehicles. I've forgotten if 7 or 8 E400's are coming over to Yarmouth from Kings Lynn but either way including the 4 vehicles normally on the X1 shorts it shouldn't leave Yarmouth short of vehicles unless there are serious shortages due to maintainace etc. 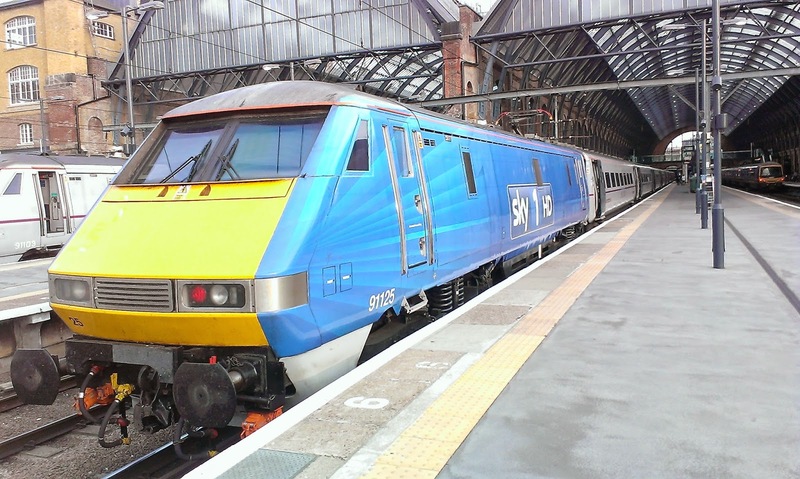 I guess time will tell how successful this split will be, but since the connections at Norwich are not guaranteed I still think that this decision may not have been taken with the passenger's best interests at heart, but with half an eye on Anglian instead. If the maximum extra delay First envisage is only 6 mins, if the timetableis to be believed, was that really sufficient reason to split the route? It will be interesting to see what happens in 18 months when the roadworks are complete. So after emerging bleary eyed from St Andrew's Bus Station in Edinburgh I was looking forward to seeing a true plethora of vehicles and colours. So naturally the first bus I saw was a First 52 reg President. After pinching myself to make sure I wasn't still on Megabus in the middle of a nightmare (bad dream not the journey) one of Edinburgh's new trams came gliding round the corner from Princes Street. My word they are smart and I love their livery. After meeting up with my Scottish correrspondent, Grace, which was a thrill in itself, we decided to spend a few hours just riding around. Of course we had to start with the trams, so a day ticket was purchased, of which more later, and we boarded the tram going the wrong way to theYork St terminus so we could bag the best seats for the trip to Gyle. Quiet, smooth, maybe a little warm but that won't be a problem often in Scotland. They also go extremely well on the non road sections. 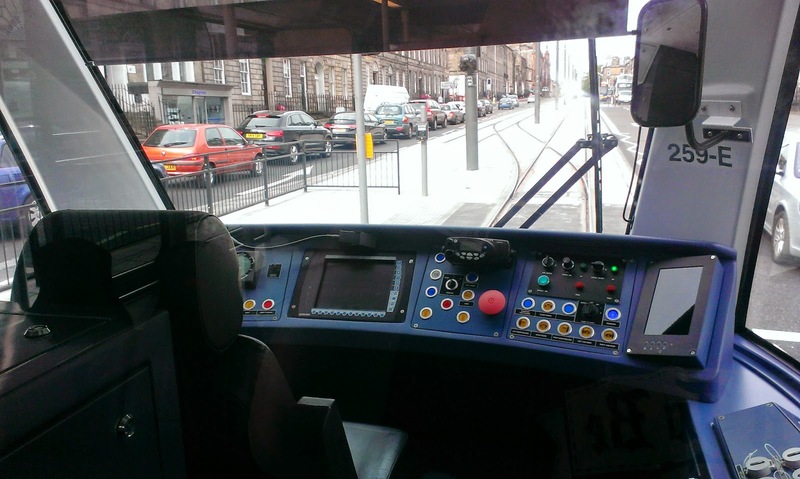 I must mention the on board staff, who were a real credit to Lothian Transport. We had a long chat on the way back with a Conductor and her trainee, and it was a real treat. And here is a short video I took at Gyle of the tram departing. Not the best but a bit spur of the moment! So after lunch there were a couple of things I wanted to do, and a ride on a no.1 was top of my list. So we boarded one of Lothian's Volvo B7 hybrids for the short trip to Easter Road,so I could see Hibs football ground. Now I am a fan of B7rle's - love them, but these hybrids are a bit disconcerting. The way the engine cuts out every time the bus stops just makes you think it's continually stalling. There is also a big gap between the electric motor cutting out and the diesel engine firing back up. The sudden variance in engine/motor noise makes it impossible to hold a conversation without either sounding like you're shouting when the engine cuts out, or not being able to hear what's being said when the engine is active. They do look good though! After catching another one to the other side of the City so I could see Heart's ground too, Grace said she had never been on a 10, which is operated by rather grandly liveried E400's. 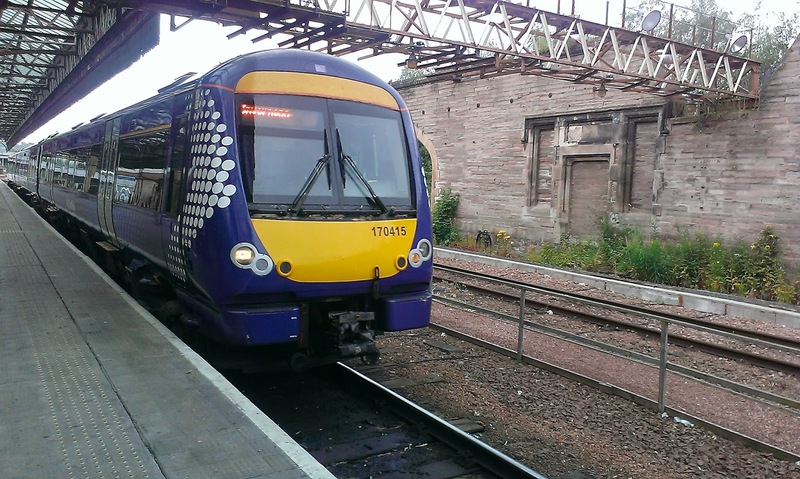 I too was interested to see how the E400's were like in Scotland, since they are built in Scotland. Alas it was the same old story - they look magnificent but it all goes downhill once they start moving. The usual rattles from components that just should not be rattling for at least another 10 - 15 years. A nice trip through the posher parts of the city though and a good photo opportunity at the other end. Finally back to the cost of all that. 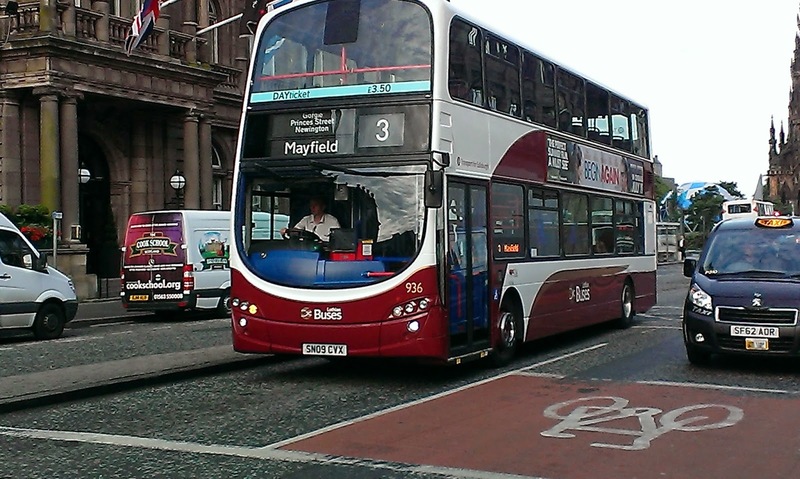 Lothian do a day ticket that is valid from the first "day bus" till the last "day bus", so everything except night buses. It is also available on the trams all day, except to the airport. 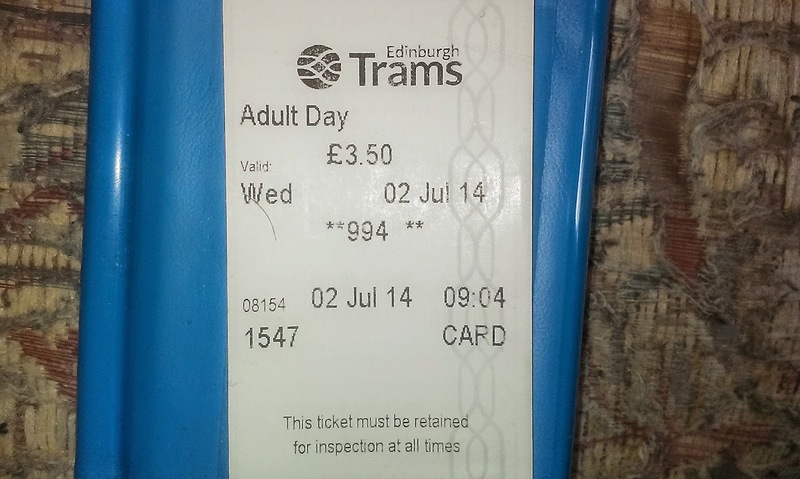 A pic of the ticket is below and it is worth remembering that day buses operate from around 5am - 1am 7 days a week. It is also worth remembering that an Anglian day ticket is £7 and a First network ticket is £14, although that is being reduced when the X1 changes come into effect. Now how cheap is that. Makes you want to spit at the prices in our region. In the next post an 18 hour day trip to Skye. Stay tuned!